Preheat the oven to 425 degrees. Line a baking sheet with parchment paper. Toss the brussels sprouts, rosemary, nutmeg, olive oil and salt together and arrange in an even layer on the baking sheet. Roast in the oven until browned and caramelized, about 30 minutes, tossing once halfway through. Arrange the bread on the sheet pan and toast in the oven until crispy but not overly brown, about 3 to 5 minutes. 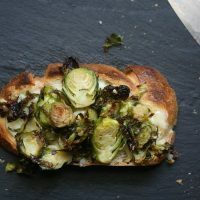 Divide the cheese between the toasts and top with the brussels sprouts. Place the sheet pan under the broiler until the cheese is melted and beginning to brown, about 2 to 3 minutes. Cut the toasts in half and serve immediately.